Hong Kong WinterFest! In winter, Hong Kong’s skyline shines with more glamour than usual as buildings get dressed up for the festive occasion. 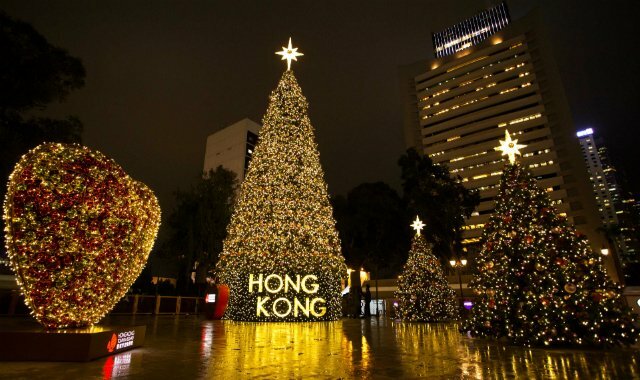 Soak up the romantic ambience under the iconic Statue Square Christmas Tree! This winter, a dazzling 18-metre-tall Christmas tree will spread the joy of the season from the heart of the city in Statue Square. Take photos with Santa Claus and his friends during their appearances at Santa’s Lodge, and enjoy classic carols performed by Christmas choirs. Drop by and soak up the festive ambience amidst a forest of glittering skyscrapers! Santa Claus and his friends will make appearances at various times on 1-3, 8-10, 15-25 December. Christmas choirs will be performing at various times from 18-24 December.